This vintage wool scarf was my Grandmother's, and just this past Christmas my mom unearthed it from the cedar chest and let me take it for a while- It apparently used to have a matching skirt, which would have been a dream, but I guess no one knows what happened to it. I love the complimentary colour scheme- it feels perfect for Fall, and it's actually quite warm...like almost too warm ( at least to pair with a sweater). I tried to keep the rest of my outfit simple so the scarf could shine, but looking at these now, I feel like maybe there's still a little too much going on. This sweater is one of my favorite thrifted finds though, and I don't wear it nearly enough. The ferry over to staten island is free, so we decided to give it a go one evening. We went a little too late, so things were mostly closed and shutting down once we arrived- but it was more about just doing something we hadn't done before and the free ferry ride- being out on the water while the weather is still nice, and so on. Next time we go, I'd like to have more of a plan and an idea of destinations- points of interest on the island. it's a little harder to get around- the public transport isn't as extensive, and we don't have a car, but just walking around together as the evening set in, seeing Manhattan across the water, and exploring the neighborhoods that feel way more residential than anything in New York, made for a nice evening. We ended up getting rice balls at a local restaurant with raving reviews, and they were enormous and really great. your outfit is amazing! I LOVE your purse! is it thrifted? also, Staten Island is so wonderful. My cousin happened to have been living there while I was in NYC so I got to spend a lot of time there. In my opinion, it is NYC's best kept secret. I haven't been since the hurricane, and I heard there was a lot of destruction there, but I am sure it's still charming. I like that scarf. And it has a story too. Gorgeous scarf! I am happy that you were able to rescue it ;) Would you be able to keep it? The colors will surely fit nicely with your winter wardrobe. The rice balls in Staten Island were japanese onigiri or of another type? be still my heart! these images are breathtaking! 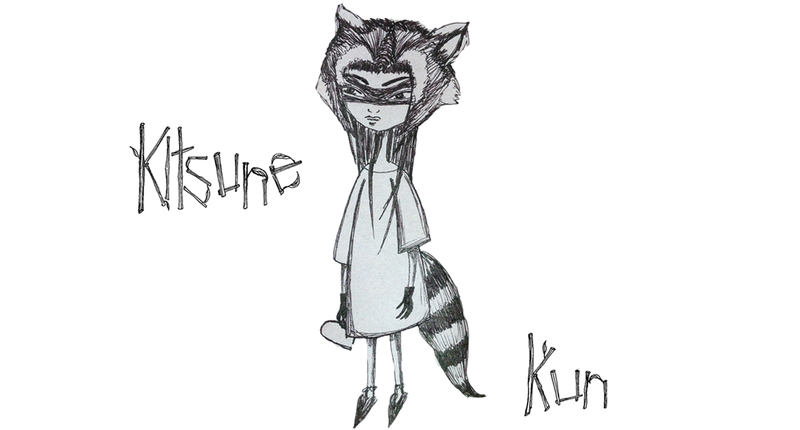 Hi, I'm Kathryn, and welcome to Kitsune-Kun, a little space on the web in which I like to document my passion for artfully dressing, treasure hunting, exploring, and designing my way through life. I also run a little shop over at etsy selling vintage and some handmade items. Thanks for stopping by! You can reach me at kb.kitsunekunblog@gmail.com with any questions or offers, and I'll do my best to reply right away!